Antti Raanta was thrilled to get his first win as a Ranger. Photo courtesy of MSG Photos. The Rangers (4-2-1) got an excellent performance from their backup goaltender Antti Raanta in his debut in blue, making 22 saves in a 4-0 win over the San Jose Sharks (4-2-0), snapping their three game losing streak in the process. The Rangers really took the phrase “put up or shut up” to heart. After some criticism from media, their coach, and themselves, the players completely turned things around, playing their first complete, 60 minute game of the season. There’s also a bit of déjà vu for Rangers fan. 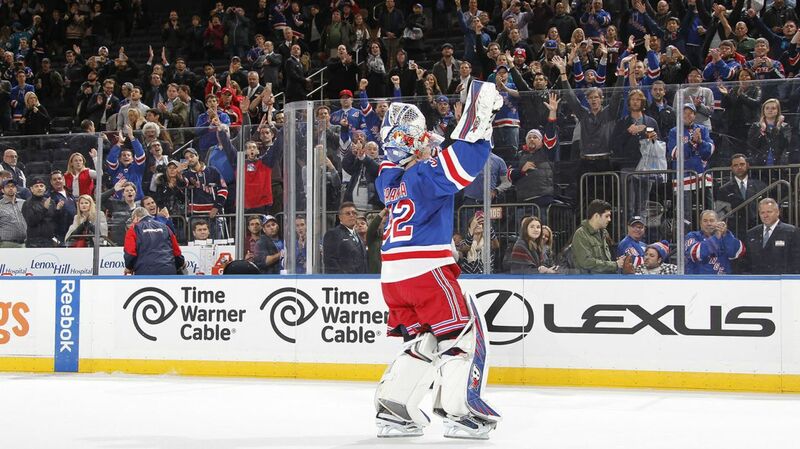 Last year on October 19th, the Rangers beat the Sharks 4-0 at MSG for their first this win of the season. Exactly a year to the day later, they did the exact same thing. Antti Raanta turned aside 22 shots for his fourth career shutout, and his first win as a Ranger. Raanta became the first goalie to record a shutout in his Rangers debut since November 2, 1957 (Marcel Paille). Raanta has also been superb in home games, posting a 15-0-3 record with a 1.51 GAA, a .944 save percentage and four shutouts in 20 career home games. Like they’ve done many times this season, the Rangers opened up the game with a really strong first period. Against a strong San Jose Sharks team, New York actually controlled a lot of the play, recording 13 shots on goal and taking the lead. The game began with a tough, physical, dump and chase style of play. There wasn’t much room in the neutral zone and it took a few minutes for things to open up. Antti Raanta, making his Rangers debut, turned aside his first shot faced; a Brent Burns blast from the point that he deflected away with his shoulder. Raanta, made some really tough saves in this period, including turning aside two backhanded chances from Tomas Hertl and Joe Pavelski. After a few chances, the Rangers broke through first just over halfway through the period, with Marc Staal firing a wrist shot that pinged off of the crossbar and into the net, his first goal of the season. The Rangers talked about getting bodies to the net, and Jesper Fast was right in from of Jones to block his vision. The assists went to Derick Brassard and Fast. Rick Nash had an excellent, recording three shots on goal and two hits. He had an excellent takeaway in the offensive zone, dancing around Brendan Dillon before firing a wrist shot that was stopped by Jones. Nash looked hungry, creating chance after chance and playing with a physical edge. The first line was fantastic, and did everything but score. The Rangers entered the dreaded second period, where they have struggled this season, and they were able to carry over the momentum they had from the first period. 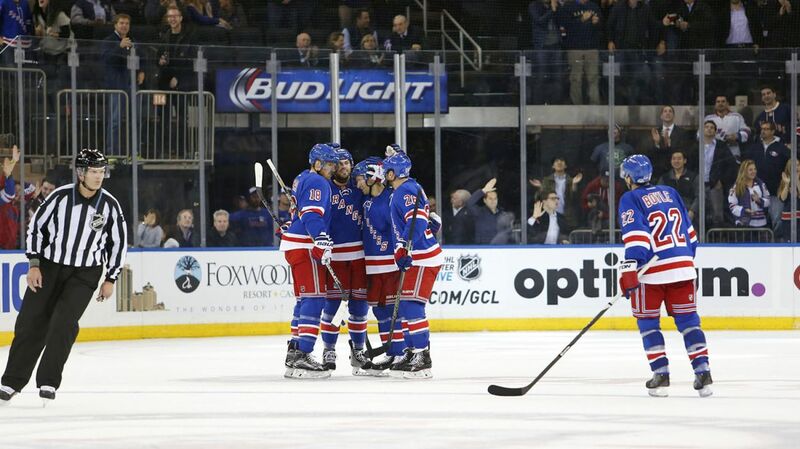 The Rangers outshot the Sharks 10-4, keeping their offense from doing anything significant. They also kept some pressure off of Raanta by blobking 15 shots through the first 40 minutes. The period did not start well at all, with Dan Boyle taking a tripping penalty 1:29 into the second period. Marc Staal followed that up with his own tripping penalty giving the Sharks a 22 second 5-on-3. The Rangers killed off the penalty extremely well, creating more scoring chances than the Sharks themselves. Dom Moore came closest to scoring, hitting the outside of the post. The Rangers got their first power play of the game after Dylan DeMelo tripped up Viktor Stalberg. The Rangers were just 1-16 heading into this game, but they converted on this man advantage. Mats Zuccarello fired a shot through a Rick Nash screen after some great cycle work, his fourth goal of the season. Nash and Boyle each picked up an assist. This was a huge moment in the game. The Rangers needed to use the power play to start extending their lead in games, and they did so here. The goal sent the Rangers into the locker room with a 2-0 lead. Yet again, the Rangers did not hold back in the third period, refusing to go into a defensive shell and staying on the attack. The defensive effort was exceptional, and they added two more goals in this period. After hustling and forechecking for the entire period, Jesper Fast got his reward. Chris Kreider banked a gorgeous pass off of the boards to a streaking Fast. He carried the puck to the front of the net, making a light touch on it before losing control and having it deflect off of Martin Jones’ stick and into the net. It was his first goal and point of the season, and the Rangers went up 3-0. //platform.twitter.com/widgets.jsAfter Rick Nash and Chris Kreider both hit the post less than 30 seconds apart from each other, the Blueshirts got their fourth goal courtesy of Viktor Stalberg, his first as a Ranger. Marc Staal made a superb play in his own zone, poking the puck away from the Sharks to prevent an attack. Stalberg immediately picked it up and used his incredible speed to bust up the ice, fight through two defenders and shoot the puck off of a defenseman’s stick, sneaking through the pads of Martin Jones. Raanta made nine saves in this period, including this gem on Tomas Hertl. When the horn sounded, the Rangers snapped their three game losing streak and picked up their first shutout of the season. Let’s get this out of the way first. Rick Nash was freaking awesome. Nash was physical, he was forechecking, he was creating chances and he picked up an assist. His four shots on goal was second on the team to Dominic Moore, and he also hit one off of the crossbar. His screen was an integral part of Zuccarello’s goal, and this was his best game of the season. The defensive effort from the Rangers was absolutely superb. Kevin Klein has been the team’s best defenseman, leading all d men in possession with a corsi around 58%. Klein and McDonagh have been a formidable pairing for two games. Marc Staal picked up a goal and an assist, making some marvelous plays in the game. Jesper Fast and Viktor Stalberg don’t get enough credit for the type of game that they play. They are two of the best forecheckers and defensive players on the team, regularly forcing turnovers due to their pressure. And then their speed becomes a massive weapon on the counterattack, which is how they both scored tonight. These two really should be penciled in the lineup every single night. Raanta deserves a lot of credit. He hasn’t played all season, gets called upon to end a three game losing streak, debuting for the Rangers and in MSG, all in one night. And he goes and shuts out on of the better offensive teams in the league. That’s impressive. The Rangers have two nights off before taking on the Arizona Coyotes, who are off to a surprisingly good start to the 2015-16 season. Posted on October 20, 2015, in Game Recaps and tagged Alain Vigneault, Chris Kreider, Dan Boyle, Dan Girardi, Derek Stepan, Derick Brassard, Dominic Moore, Dylan McIlrath, Emerson Etem, Jarret Stoll, Jesper Fast, Joe Pavelski, JT Miller, Keith Yandle, Kevin Hayes, Kevin Klein, Madison Square Garden, Marc Staal, Martin Jones, Mats Zuccarello, MSG, New York Rangers, New York Rangers blog, NHL, NYR, Oscar Lindberg, Rangers, Rangers blog, Rick Nash, Ryan McDonagh, San Jose Sharks, Viktor Stalberg. Bookmark the permalink. Leave a comment.